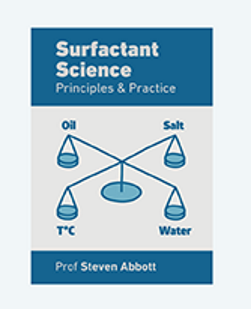 Everything I've learned whilst developing Practical Surfactants and formulating in the real world is brought together in my book Surfactant Science: Principles and Practice. 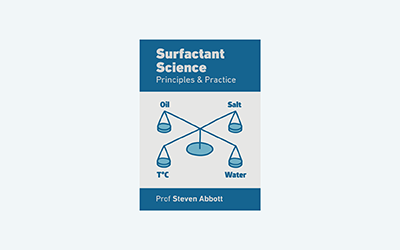 It is 255pp and contains lots of good science, with links that take you straight from the book into your default browser to explore the relevant app within Practical Surfactants. It is completely free and is not tied to any advertising or email list and doesn't require registration. For a set of YouTube videos describing some of the key elements, see below. Finding out what is useful and what is not. HLD gives immense power to understand formulation space. Then add NAC for even more predictive power. Exploring the core ideas of foams and their stability. Some areas of surfactant science do not yet have a good theory. It's good to be honest about this and we can see what a new theory might be like. Most of us don't like phase diagrams. Here you learn to love them, helped by the apps. We have the theory, now what can we do with it? A lot! You just click to download it and start reading in the format of your choice. I want all users of surfactants to have access to an up-to-date description of what science is useful for surfactant suppliers and users across all the relevant industries, e.g. : cosmetics, detergents, oil recovery, polymerisation, nanoparticles. And by linking to Practical Surfactants you get all the benefits of the live apps. On an iPad, for example, a click on a link takes you to see it in Safari and a 4-finger swipe allows you to go back and forth between book and app. On a laptop it's even easier to swap between the two views. The book is Copyright © 2015/18 Prof Steven Abbott and is distributed under the Creative Commons BY-ND, Attribution and No-Derivatives license. There is an issue about footnotes for the eReaders (not for PDF where they are at the bottom of the fixed page). The best eReaders allow pop-up footnotes which just appear when you click them. Most of us dislike footnote links that take us to the end of the chapter or the end of the book as we sometimes don't know how to get back. But eReaders aren't too reliable about pop-ups so I've defaulted to end of paragraph. PDF. Surfactant Science.pdf. [If you want to download it, use right click.] On a high-res tablet or laptop, PDFs offer a good reading experience and it is the simplest to get going; on a smartphone it may be less pleasant to read. ePub3. Surfactant Science.epub. This works on phones, tablets, PCs, Macs with modern ePub3 readers such as iBooks, Calibre, Azardi, IceCream etc. How do you get it into, say, iBooks? I use Dropbox on my iPad and choose iBooks to run it. You may find other ways via, say, email. Kindle mobi. Surfactant Science.mobi. Mobi is generally agreed to be a deeply unsatisfactory format and it is frustratingly hard to get the format right, but Amazon continues to use it so we all have to produce it as best we can. This version seems to work OK but don't blame me if there are glitches. How do you get it into your Kindle reader? On my PC I simply put the file into the My Kindle Content folder and run Kindle for PC (it won't work on the Windows App version) where it automatically appears in my available books. I don't have a stand-alone Kindle reader so I don't know how to get it on to one of those, but I believe it is not too hard. For simplicity/reliability, footnotes are at the end of the relevant paragraph. Here are 9 videos that give a quick guide to the key themes of the book and this site. My task has been to find the good, useful scientific principles and distill them into words and apps that allow people like me to use in practice. In addition to reading books and many 100's of academic papers, I've had the chance to meet and learn from some of the great modern surfactant scientists and many that I haven't met have most generously helped me via email. All through the book, and in any app where I needed help with the algorithm, I acknowledge their generous inputs. All the credit for the science goes to them. All the blame for errors in describing and implementing their science goes to me.